Mother of two decides to give up job, leave England and follow Husband to Norway. One of the many things I love about winter is the darkness, but since moving here it has been a bit of a shock to my system. On entering the country in August, I gave up smoking and took up running, over the past three months this has become increasingly difficult. I have been saying goodbye to my Son at 7.20am as he goes off to school in his high visibility vest, turning back into the house and wanting nothing more than to either get back into bed or drink copious amounts of coffee and smoke cigarettes. Today is the first day I have noticed a change. It started to get light at 8.11am and it is 4.45pm now and darkness is yet to fall. I can feel my energy returning as I type. This entry was posted in Blogs and tagged housewife, Norge, North, Norway. Bookmark the permalink. 2 Responses to 4.30pm and still light!! 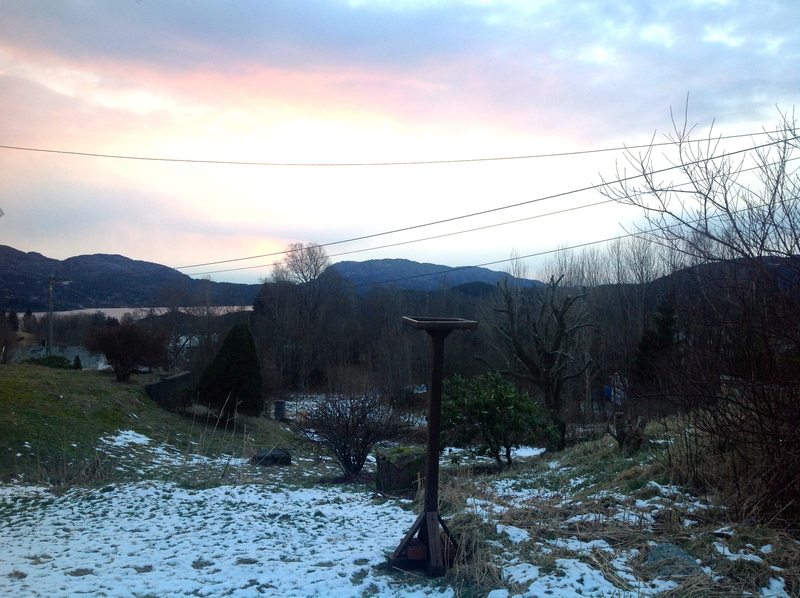 I love the colors of Norway’s winter skies, but this season hasn’t given too many of them. Your photo captures it!! And now – it’s almost noon on January 31st, and there’s a bright light shining in my window. The glare on the computer screen is annoying. I can deal with it! A spot of cross country in Furedalen. To Croc or not to Croc……. When the lights went out…..
Views from viewing platform on Mount Fløyen, Bergen. Stunning view from Mount Fløyen, Bergen. Bryggen lining the Fjord in Bergen. Skostredet…. roughly translates in English to The Show Street. By far one of the coolest streets in Bergen.